Whether it's from the frosty weather or at the hands of your straighteners before your 25th Christmas party, your hair can take a beating in the winter. 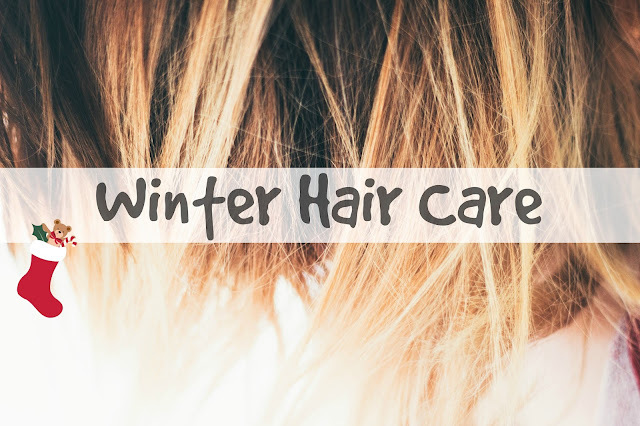 To ensure that your tresses are still silky smooth and looking gorgeous over the festive period, I've compiled some winter hair care tips for you. So pop your curlers down for a second and listen up! Here's how to avoid a winter hair SOS! In the winter, I always invest in a revitalising shampoo and hair treatment to keep my hair in peak condition. 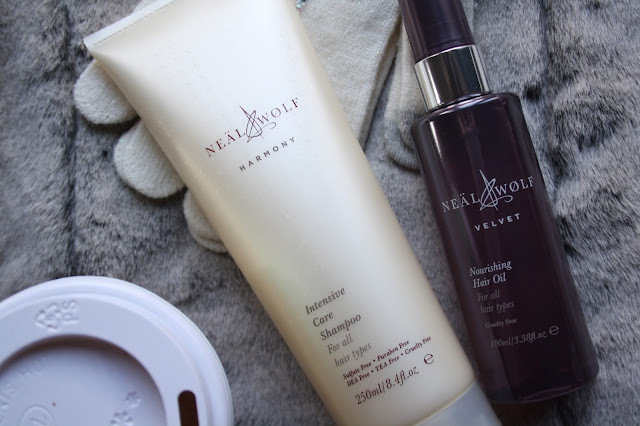 This year, I've been trying out the Harmony Intensive Care Shampoo* and Nourishing Hair Oil* from the brand Neal & Wolf. The shampoo is very thick and lathers up beautifully, even in my very thick hair! It is lightly scented and leaves your hair feeling restored. I was also very impressed with the hair oil. Although I am prone to greasy hair, this light oil added some much needed moisture without turning my head into an oil slick. Importantly, both of these products are cruelty free, so they are guiltless purchases! I was gifted these products by the lovely people at thebeautybooth.com, who stock an enormous range of hair and beauty brands for men and women. Every order comes with a free gift and I couldn't recommend their service highly enough! I'm sure it's not news to you that the intense heat of hair straighteners and curlers is bad for damaged hair. So, this December I'm going to be reaching for hair accessories rather than the curling tongs when preparing for my Christmas parties. I was lucky enough to be sent a gorgeous selection of products to review from Tegen Hair Accessories. The brand are based in Brighton and specialise in glamorous but affordable accessories. As well as their own Ooh La La! range, which is handmade in France, they stock the gorgeous vintage-style pieces of designer Rosie Fox. Keep scrolling to see what I thought of my items. Here I am, modelling (LOL) three of my favourite hair pieces from Tegen. On the left we have the Vintage Crystal Filigree Kirky Grip*, which I think would be perfect for a Christmas party! It's glittery and glamorous without being over-the-top. The high quality of the item is clear and I would have expected it to cost a lot more! In the middle, there is the White Tokio Hair Clip*, which is studded with real swarovski crystals! This holds in firm, even with thick hair, and would go with pretty much any outfit. The tiny crystals catch the light beautifully. Finally, on the right you can see the Black Crystal Flower Headband*, designed by Rosie Fox. This headband is super lightweight and comfortable, and the quality is very impressive. It will be getting a lot of wear over the festive season! If you want to pick up some accessories of your own from Tegen, I even have a discount code for you! To get 10% off your order, use the code ABBEYLOUISAROSEBLOG at the checkout. What tips do you have for caring for your hair in winter? Please share in the comments below!